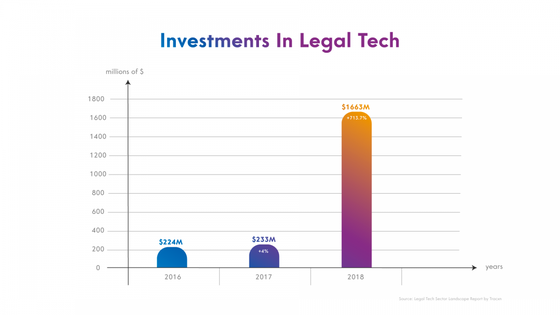 We will now consider legal tech companies that received the largest investments in 2018. The company’s value is to provide one of the best e-signature technologies and electronic agreements in the world. DocuSign operates in 188 countries with more than 100 million users. In April 2018, the company launched an IPO and raised $629 million worth of investments from public shareholders. One of the first law companies that specializes in providing their services online, and the most successful of them. The main service is the creation of various documents – from lease contracts to wills. LegalZoom has 4 million users and has an estimated worth of $2 billion. A company that develops and improves software for e-Discovery. Among the clients of Exterro, there are four main groups: small- and medium-sized businesses, law firms, legal departments, and corporate IT specialists. Products and services of Exterro are already used by such giants as Microsoft, Visa, Starbucks, and so forth. This legal tech startup that was launched by the co-founder of Twitch video streaming service and Y Combinator partner, Justin Kan, and one of the partners of a top law firm in Silicon Valley, Augie Rakow. Atrium aims to become “the largest multi-practice firm in the United States” through the use of new technologies that will increase the efficiency of performing legal tasks of varying degrees of complexity. The list of investors is impressive: Andreessen Horowitz, General Catalyst, Y Combinator, Thrive Capital, and others. We’ll see if Justin Kan will succeed in legal tech to the same degree as he did in other industries. This company provides services in the field of contracts audit using machine learning technology. In September 2018, Noah Waisberg, who is the co-founder of Kira Systems said that over the past year, the company had more than doubled its team and has more than 100 employees. Revenue for the year also doubled, which certainly was one of the decisive arguments for investors, who decided to invest $50 million in Kira Systems. I am sure that in 2019, the legal tech industry will not slow down and will continue its development, which will be reflected in both venture investments and new IPO launches. I hope you will recall my words when among the unicorns like Uber and Airbnb, some legal tech company will publicly offer its shares.